Argentina Football Association president Julio Grondona says Diego Maradona's future as the national team boss lies with the coach himself. 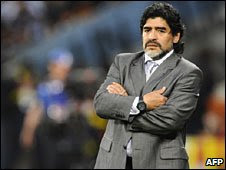 Maradona's team were eliminated from the World Cup when they were thumped 4-0 by Germany in the quarter-finals, and the manager has not spoken about his future in the position since he returned to Argentina. But Grondona said: "Maradona is the only person in the country who can do whatever he wants. He still has a contract with us, so it's up to him." Viewers of British broadcaster ITV's coverage of Tuesday's World Cup semi-final between Uruguay and the Netherlands might have been wondering why commentator Clive Tyldesley was doing so much talking. The reason was that regular co-commentator Jim Beglin, due to join Tyldesley in Cape Town, was struck down by an ear infection and ITV were unable to recruit another summariser in time. The Netherlands has woken up to an understandable case of Orange fever after the team reached their first World Cup final for 32 years. The country's leading newspaper De Telegraaf simply lead with "FINAL" on its front page, saying that the Oranje could now "smell gold". The NRC Next daily added: "Finally, icons for our couch potato generation." Reports suggested more than 80,000 people watched the match on big screens in Amsterdam's Museum Square.